Serendipity 2015: Have you ever wondered what it’s like to create a picture book? January 27th, 2015 by elena | Comments Off on Serendipity 2015: Have you ever wondered what it’s like to create a picture book? The Vancouver Children’s Literature Roundtable is pleased to announce that Molly Idle and Kelli Chipponeri will be speaking at Edgy, Erie, Exceptional Serendipity 2015. Come to Serendipity 2015 and find out first-hand what is involved in creating these stunning works of art (and literature) for children with special guests Molly Idle and Kelli Chipponeri. Molly Idle is the author and illustrator of numerous picture books, including the Caldecott Honor winning Flora and the Flamingo (2013) and its equally enchanting companion Flora and the Penguin (2014). She also illustrated the delightfully unnerving Zombelina (2013), written by Kristyn Crow, and wrote and illustrated the whimsical Tea Rex: A Young Person’s Guide to Tea Party Etiquette (2013). We are also delighted to introduce Kelli Chipponeri, Editorial Director, Children’s, at Chronicle Books, who has worked with Molly on a number of projects. Kelli previously worked at Running Press and in 2010 moved to Chronicle books as their Executive Editor. Her knowledge and expertise on the subject of picture book publishing is phenomenal. Bring your questions and be prepared to get inside information on the children’s picture book publishing experience from this dynamic duo. Intrigued? Then be sure to register for Serendipity 2015 while the early bird rates are still in effect! Edgy, Eerie, Exceptional Serendipity takes place March 7, 2015 at UBC. Posted in Events, picture books, VCLR | Comments Off on Serendipity 2015: Have you ever wondered what it’s like to create a picture book? 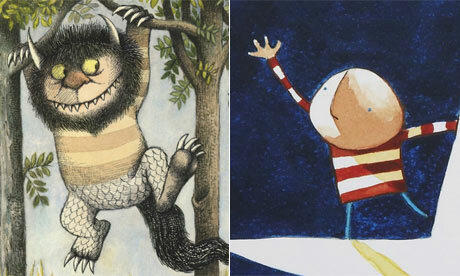 There is an interesting blog in The Guardian by Award winning author Oliver Jeffers and how much he was influenced by Maurice Sendak.